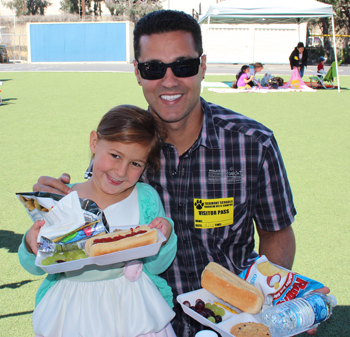 Our Anaheim Hills families had fun in the sun at our Celebrate 2013 Picnic! Cougar Chorus Season Ends Strong! Our Anaheim Hills after school singing group called Cougar Chorus performed at their Spring Concert a few weeks ago. There are 55 students in the group from 3rd, 4th and 5th grade. They meet with Mrs. Zavoral every Friday after school to practice developing their singing voices and to learn how to sing in harmony. At the concert, students performed a variety of pieces including their traditional chorus cheer, an African folk piece, a classical piece by Mozart sung acapella, and a jazz piece called "Accentuate the Positive." During Spring Break, the chorus took time to visit the senior citizens at the Brea Senior Living Center. Chorus members sang their concert pieces and gave cards away to the seniors. Many of the seniors clapped to the beat and joined in song! Cougar Chorus has done more than just cheer up folks during their spring break. Earlier this year, they performed at the FPA Santa Train, the Book Fair during Open House and the Girl Scout National Day Event. Now the chorus season is over, and students will celebrate their hard work by going on a special field trip to the Merlin Magic & Comedy Show. Congratulations to the chorus students and to Mrs. Zavoral on a very successful year! Congratulations to Matthew C., Meghana K., and Cameron O. After competing at the North Tustin's own science fair, they were amongst 15 students selected to compete at the Orange County Science and Engineering Fair (OCSEF). There the three North Tustin students qualified to compete in the California State Science Fair (CSSF) on Tuesday, April 16th, 2013. On that day, students took their science fair projects to the Discovery Science Center in Los Angeles to compete and test their projects against California's top science students. Over 1000 incredible projects were on display, and while the scores were recorded in the afternoon the students headed to lunch and then patiently await the awards ceremony later that afternoon. Even with so many amazing projects, we are excited to say that each North Tustin student attending the CSSF was recognized by the judges. Matthew C. was awarded an honorable mention in the Material's Science category, Meghana K. was awarded an honorable mention in the Cognitive Science category, and Cameron O. was awarded second place in his category, Material's Science. This was a wonderful affirmation of these 3 students excellence in science. We are incredibly proud of their efforts. Historic Anaheim 7th Grader Makes a "Splash"
It started one day in February. Michelle joined 200 youth divers at the auditions for an upcoming reality show called Splash. The television show has celebrities competing in a diving competition. Each week the lowest scoring competitor is eliminated from the competition. For the audition, Michelle performed 5 dives of her choice and camera test interviews. Later, Michelle found out that she got the part on the show. She trained with her celebrity partner for two weeks (the show forbids Michelle from revealing which celebrity she is partnered with). Michelle has been diving for four years. She practices 3-4 hours a day, 6 days a week at both Fullerton College and the Rose Bowl Aquatics center. Recently, Michelle competed in the National Championships in San Antonio, Texas. Michelle dove well enough to win 5th place! You can see Michelle and her mystery celebrity partner diving on Splash which will air on Tuesday, April 23 on ABC at 8:00 P.M. Make sure you tune in.